Every occasion is made more special, by the clothing we choose to wear. All who purchase attire, specifically to attend a unique event, have one thing in common. They want to "make an entrance," or be "the Belle of the Ball." Of course, clothing may not be the only strategy that serves this end, but what we wear certainly conveys an impression. We all strive to send the right message with our apparel, by incorporating our personality and individuality into our outfit. Accessorizing with jewelry is one way to stand out among the crowd. Necklaces are a particularly effective way to increase the memorable impression we desire, since they are worn close to the face and lie directly on our clothing or skin. A necklace is among the most personal of enhancements which has the ability to accent our facial features, express our mood and adorn our clothing. As a designer of dresses, bridal wear, lingerie or sporting competition attire, drawing your client's eye to the most extraordinary attributes of your creations is important. Embellishing with the use of necklaces is the perfect method to accomplish this! 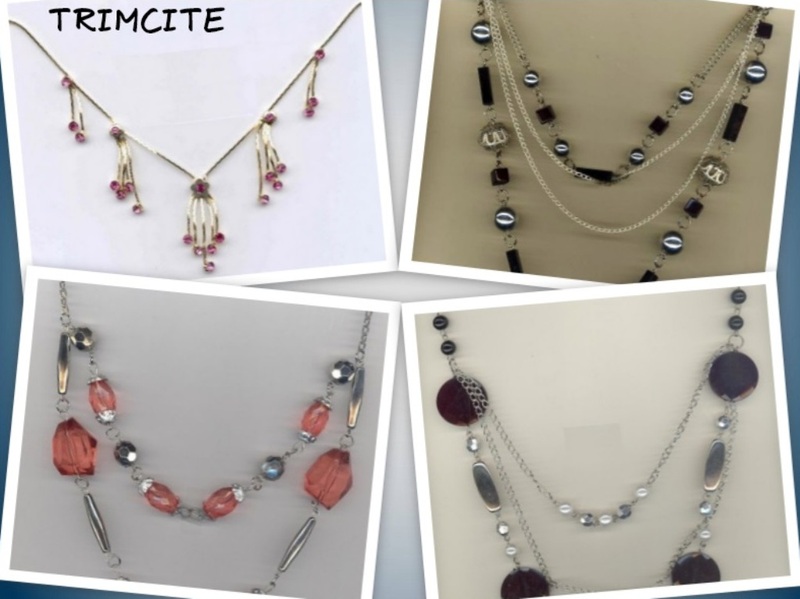 TrimCite furnishes distinctive necklaces for all your design needs, whether you want to incorporate them into your garments or simply display them with your inspirations for added visual effect or add-on sales potential. Contact us to browse our hundreds of necklace styles and discover the perfect enhancement for your market. Necklaces in every length and style, made from an enormous variety of unique materials can be found in our immense selection. Find the quintessential compliment for every type of design from Bohemian to classic.